Isn't she too cute. I just got her today and she will be available tomorrow I think at Pink Poison which has changed there name now but I can't remember what to LOL.... She is also going to have some digital stamps tomorrow for sale of a couple different Anyas. I have some male ones to show you tomorrow which come from the same company and which are too cute. I know I already did this one but thought I would make another one she is just so darn cute. This one is made with copics and the cupcake in the background is a diecut that I used. I thought it matched it real well. Well I finally got time to go in my scraproom tonight. 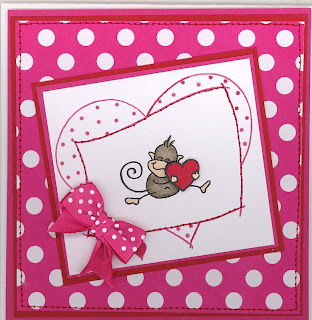 Here are some cards I made with an Exclusive Stampendous Chantigo monkey set I found at Archivers today. Arn't they just adorable. Sorry guys I have been a very bad blogger but my son has been up from his dad's over the week and then I started work again last night. I bring him back tomorrow after work so plan on making some cards and finally relaxing this week. I have so many new stamps to use and new markers it is almost overwhelming on what to do first..... Hope everyone is having a great weekend. 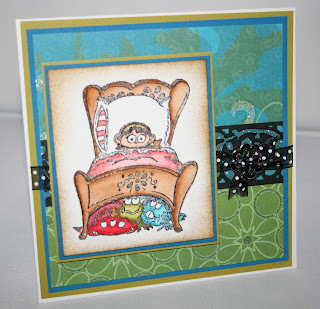 Here is another adorable stamp by Victoria Case. 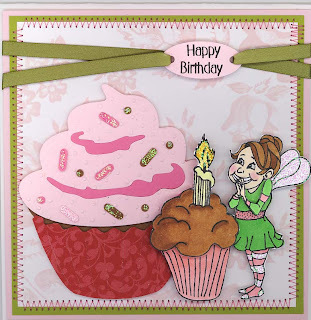 Think of the cute birthday cards you could make with this stamp and who doesn't love Fairies and Cupcakes. 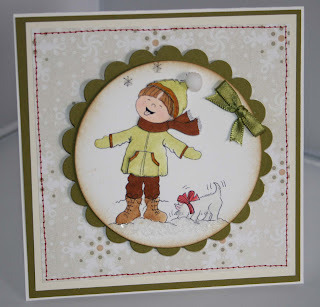 This card is watercolored and paper is DCWV Sweet Stack. 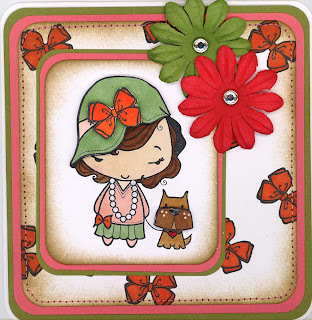 This stamp along with all her adorable other ones can be found at her website Victoria Case Art Designs. Hopefully everyone is ready for Christmas. I just have stocks to fill and I am good to go. Have a great Holiday. 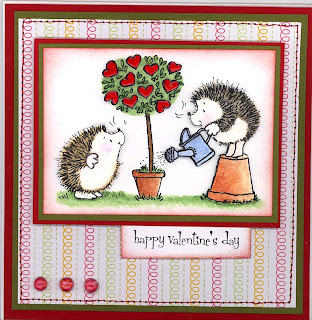 Here is a new Hedgie's Valentine stamp I just got from HMstamps. I colored this in Prismas and Gamsol. I just love how it turned out. 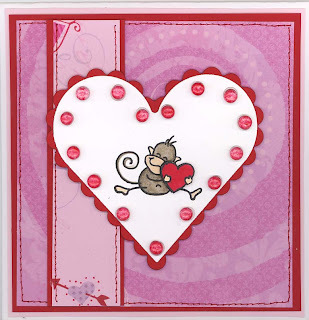 The hearts are colored in copics and lacquer added to each one so it would stand out. Everyone ready for Christmas? My sons mich for his xbox went out so my husband ran over to Target today to find him a new one. He didn't even think about how busy it would be today haha. Needless to say all the michs were gone but he did find one at gamestop. It's cold here and we got 10 inches of snow yesterday and more in the forcast for Tuesday. This little guy from Victoria Case is so adorable. And very easy to whip up in a seconds notice. I received him on Friday and needed some last minute Christmas cards so I whipped up 3 different one's that I could mail out on Saturday. They all only took me a few minutes to make but yet they look very elegant. I used flocking on the hat. I have a couple more of hers to show you this week too. These can all be bought at her website Victoria Case Designs. If you haven't been there yet be sure to check them out. They also are on ezmount already and come with a color copy of the stamp so you can see it already colored which is great. Hope everyone is having a great weekend..
Wow I have been totally busy getting ready for Christmas. The last 2 days I spent baking cookies and fudge. Then tonight I packaged it all up for work, and hubby's work and my parents. 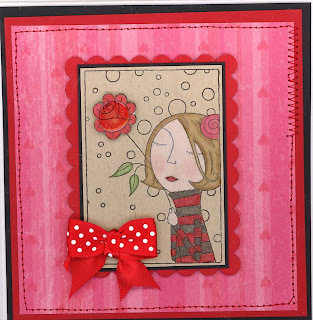 But I did find time to make a few cards today. 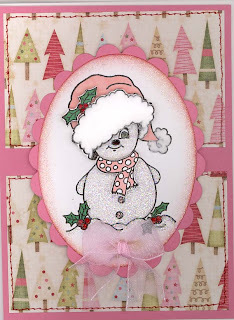 Tonight I am showing you a new SugarNellie's one I got which can be bought at Funky Kits. Then tomorrow will show you some new Victoria Case ones I did. 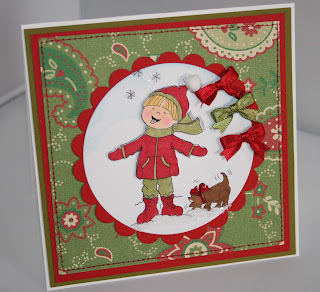 The designer for tonights card from Sugar Nellies is Leanne Ellis. She is brand new to Sugar Nellies and I can't wait to see what else she comes up with. 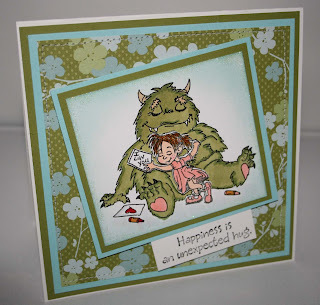 This card was stamped on Kraft Paper from Papertrey Ink and then I used my colored pencils and gamsol to color it. I added Lacquer to the inside of the flower. Pretty simple but still very cute. I needed a baby card tonight for one of my co workers. Him and his wife are having a baby and she is due today. I figured since the holidays and I only work 2 days that I might as well give him his present I made for him. I made a fleece tie blanket and then got him an outfit and some bottles. No baby cards on hand so I had to whip something up fast. This is what I came up with. Paper is some I had on hand. Diecut is cuttlebug. Rickrack is Bazzill. The stamps were embossed and then made 3d. They are Stampin Up Toybox which is retired. I colored with copics and distressed the edges. Sewed along the edges.. Not bad for 5 minutes I thought. I am so glad I bought my electric start last week. OMG it's freezin outside. -30 tonight with windchill. Which is crazy. Suppose to be cold like this all week. My son was stuck up at his dad's last night because he couldn't get out of the driveway to meet me they had 12 inches of snow 3 hours north of us. Brrr I am not ready for this kind of weather I need to be somewhere Tropical. 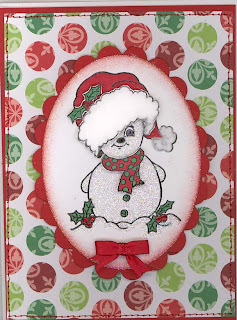 Here is a card I made with microbeads. This is not a stamp its actually some paper that is sold by Cornish Heritage Farms its so nice. 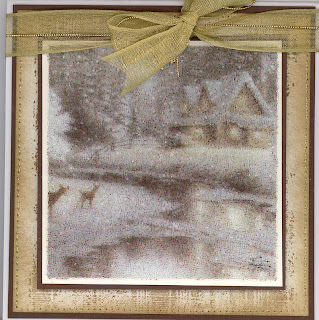 It comes in a 8 x 8 bundle which I can't remember how many are in there but its like $17 I think. So its not cheap. This piece was 4 x 4 i think. I used 2 sided tape sheets on top and then loaded it with microbeads. Its gorgeous in person but doesn't show up well in a scan. 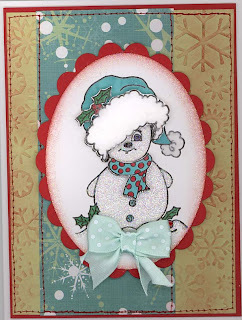 It's going to be a very slow couple of weeks on my blog as I am trying to get done with Christmas stuff. I normally put mine off till the last minute. Plus I still have my baking to do. I guess no dieting till AFTER the holidays haha. I am making some cookies for here and then my work and hubby's work. I also have a band concert for my son this week. I am done buying but still need stocking stuff and also stuff for the doggies for Christmas. They need stuff also. 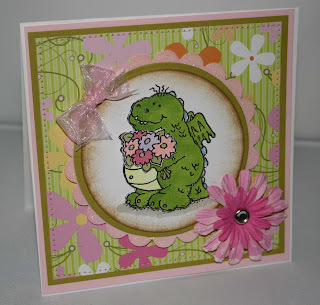 Here is a High Hopes stamp I bought that I used to make this dragon card. Colored in markers and used some scrap paper I had and flower and brads. Someone asked how many stamps I had LOL. I couldn't even begin to count. I store most of mine these days in binders which are seperated by company or designers. I have 20 of those full and have a bunch of loose sheets. I also have tons of tupperware containers full of mounted stamps along with a 6 foot high x 4 foot wide bookshelf stacked with stamping up containers which are full of different company stamps. I also have like 500 sets of stampin up which are um in cd cases. Someday I am going to count them all. 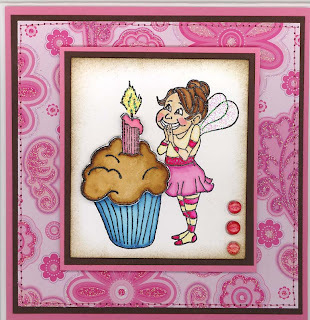 Here is another great stamp from Victoria Case which can be found at her website. 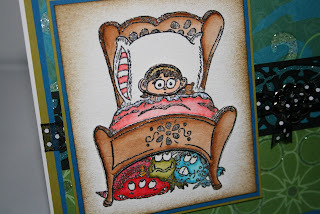 This one is called Monsters under my bed I think. I watercolored this one on Fabriano Watercolor paper which is 140# I just love it. Hope everyone is having a great weekend. We finally got 3 inches of snow on the ground and its about 20 above currently. I ran down last night and ordered an electric start for my car so I don't have to go outside to a cold car anymore yipee... Merry Christmas to me LOL working nights it will definately be nice in the morning. No more scraping. Don't you just love this little Dragon. 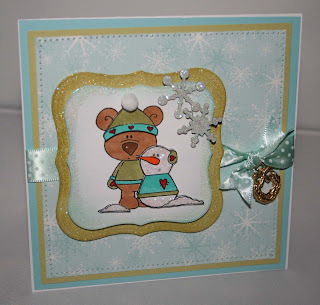 He is from High Hopes stamps. I colored him with pencils and added lacquer to different parts. 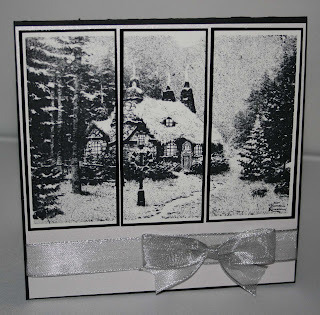 Embossed the background strip... Have a great evening..
Today I have a 2 cards I did from Victoria Case Art Designs. These are unmounted on cling sheets and also have with them a colored copy of the stamp so you can see it done already. That was very nice I wish more people would do this. Anyways I have 4 of the stamps so will post 2 cards today and 2 cards tomorrow. The top card is colored in markers and bottom in prisma... The red rubber is also nicely etched on these so I got a perfect stamp the first time I used it. Isn't she too cute. I believe I got her from Sugar Nellies which can be bought at Funky Kits link on the side. It's all colored in Copics. Today I have to show you the new digi downloads from Fred She Said. Isn't he too adorable. 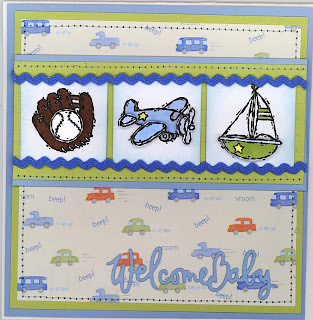 These are so great you just print them on good cardstock and you are ready to go. I see more and more company's are doing this. Which I personally love. But that is just me. These were colored in Copics. Everyone done Christmas shop yet? If not you only have little over 3 weeks left. I am done except for stocking stuff which feels great but now I have to think about paying for everything not so great LOL... Anyways have a great week.